Nylon Trolley Wheels, Size: 2" To 12"
bracket and side threaded hole. Matching up with the ever increasing requirements of the customers, our company is engaged in providing Cast Nylon Wheel. Nylon Wheel are precisely designed by our team of experts using premium grade raw material sourced from known and reliable dealers. They run for longer period of time and are available with hunger and flexible suspension. We have emerged in presenting our clients a wide assortment of Twin Wheel Nylon Castor. Our product range is fabricated from fine quality raw material in our high end manufacturing unit under the inspection of our professionals. These products are valued for their high performance and robust construction and economic prices. We offer high quality wheels. The wheels provided by us can carry a load of 10 kgs to 5 tons. We offer our client an excellent quality range of Nylon Caster Wheels. 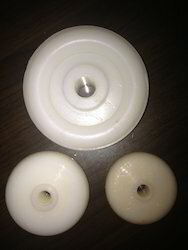 These Nylon Caster Wheels are offered in variety of designs, shapes, sizes and colours. 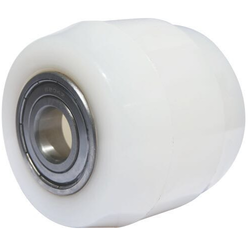 Our assortment of Nylon Caster Wheels are available at market leading prices. We are Manufacturer of Nylon Wheel.